Originally the hammered dulcimer came from Persia and India, and the great-grandmother of them all is the Persian santoor. In the past centuries this music instrument was spread over many parts of the world, probably mostly by nomadic peoples such as the gypsies. This resulted in a wide diversification, meaning that in practically each culture a different type of hammered dulcimer can be found, each with a distinct tuning reflecting the type of musical culture. The common features which remained with the santoor, the yangqin, the cimbalom and the hammered dulcimer are the trapezoid form, the large number of strings and the way they are played with different hammers. 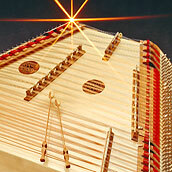 A variation of the hammered dulcimer also established itself in the European Alpine region, at first in traditional folk music and later on also in classical music, jazz, rock and world music up to the so-called new music. The interaction of rhythm, harmony and melody created by two hammers as well as the distinctive overtone sound result in the fascination emanating from this instrument. The hammered dulcimer—a drum in the circle of harmonies!